I offer a teaching approach that focuses on what YOU want to learn. Would you like to learn a specific song? Understand chords and how to use them? Learn to improvise? Play jazz or blues? Learn how to use a "fake book" and create your own piano arrangements? Explore basic song forms? Develop your ability to play by ear? You tell me what you'd like to learn. I'll use this information to specially design a teaching plan that suits your needs. Rather than work with a standard piano instruction book, I focus on teaching musical structure, primarily by starting at the beginning: intervals, scales and the building of chords from these scales. Scales are the building blocks of Western music. If you know your scales you can understand and create melodies, chords, and chord progressions. As one guide to my teaching I use my instruction text, The Marty Method, a book that evolved out of how I "explain" music to my students. The Marty Method contains all of the information I previously distributed to my students one instruction sheet at a time, only now this information has been integrated into a highly informative and easy-to-understand text. Additionally, I use any approach that helps explain musical concepts to my students — I may have you play bongos to better illustrate two-handed rhythms, or play along with a recording as we follow a chord "chart" of the song. We may run through a short composition by Bach, Mozart, Ravel, or Erik Satie; learn a Ray Charles piano run, a Jerry Lee Lewis tune, listen to the radio and determine the key of a song by ear...or learn a standard, play a finger exercise by Hanon or Czerny...basically, I'll do whatever it takes to help you become not just a pianist but a musician. Flexibility is the key aspect of my teaching approach. The piano keyboard is an organized grouping of all the musical pitches we humans can hear. These pitches are combined to form musical patterns---scales, chords, melodic lines, chord progressions. Music is mostly patterns, from the very simple (a major scale) to the very complex (Stravinsky's "Three Movements from 'Petrouchka' is a doozy! ).Songs are built from these patterns, which can be seen---literally---on the keyboard. As these patterns are pointed out, scales, chords and chord progressions become easy to visualize. You will begin to "see" songs as well as hear them. The major scale pattern by design...and therefore the twelve major scales by sight. This is not that hard! The major and minor chord pattern (just skipping keys) and therefore the twelve major and twelve minor chords. The diminished and augmented chord pattern (just skipping keys) and therefore the twelve diminished and twelve augmented chords. The numerical position of each note in a major scale (i.e. in a C major scale, C-D-E-F-G-A-B-C are numbered 1-2-3-4-5-6-7-8). How "families" of chords are built from a scale. This concept will demystify the structure of almost any pop song. Major  minor  minor  Major Majorminor  diminished. Playing chord progressions by number (1-4-5; 1-6-2-5; 1-6-4-5; 1-3-2-5, etc. ), also known as the "Nashville Number System." Easy voicings of other cool chords: 9ths, major 7ths, b9, dominant 7ths, etc. How to play chords through chord notation only (Cm9, Bbdim, C+, C6/9. etc.) rather than standard musical notation. How to play songs in "fake books" using the treble clef melody and chord symbols to create your own improvised arrangement. O.K., so that was an eleven-step approach. Sorry, I got carried away. 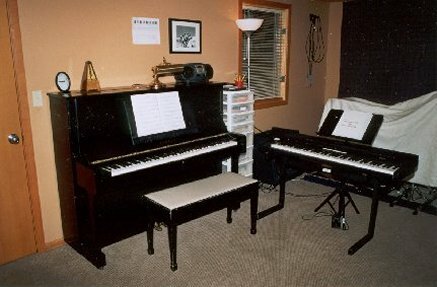 Lessons are given at my home music studio in Kirkland,Washington on a Yamaha U-1 upright piano (see photo of my studio above). I teach adults and children. Each lesson can be recorded on cassette so you can listen to it at home for review. A three-ring binder is provided for storing and organizing the handouts, sheet music and lesson notes. These include music theory articles, music notation, and keyboard templates with chord, scale and note patterns added. A CD player is at hand during lessons to play musical examples from my rather extensive CD collection, including great instructional jazz rhythm tracks by Jamie Aebersold Jazz, a wonderful aid in learning improvisation. After the first lesson, payment is made in prepaid blocks of four lessons i.e. $200 for four one-hour lessons, $160 for four forty-five minute lessons. Weekly lessons are the most effective learning approach. Some students choose to take lessons on alternate weeks. This is fine but makes record-keeping and creating an efficient master teaching schedule difficult. For this reason I have a minimum charge of $120/month for regular students.... I charge $60/hour for twice-monthly lessons. For twice-monthly students I offer one-hour lessons only. E-mail me and leave your contact information.